In the face of the onslaught from online retailers, Costco and Sam’s Club have been hawking their memberships on Groupon where they have been offering freebies and discounts to sweeten the deal. Costco has for instance been offering new subscribers a cash card worth $20 and coupons for specific products worth $36. And for purchases worth $250 subscribers get $25 off. Subscribers also get $75 off to specific destinations such as the South Pacific, Mexico, Hawaii, Europe, Costa Rica or the Caribbean when they spend on Costco-sponsored travel. Those eligible for the deals are those who sign up for a Gold Star membership which costs $60 a year. The expiry date for the offer is early November this year while the savings coupons will expire next year in late January. Two months ago when the annual membership fee of Costco was raised by $5, the annual cost of membership to Sam’s Club was reduced by $30 for Groupon subscribers who are not members of Sam’s Club. Normally the annual fee for Sam’s Club members is $45. More perks include instant savings worth $105 loaded onto the club card, a rotisserie chicken and an e-gift card worth $5. Due to the stereotype that only brands experiencing weak sales turn to Groupon, a spokesperson for the e-marketing site reiterated otherwise. “The implication that only damaged brands use Groupon is old and tired. In addition to Costco and Sam’s Club, we’ve featured other hugely successful brands such as Amazon (Kindle Unlimited & Audible), Apple Music … among others,” said the Groupon spokesperson. The spokesperson for Groupon added that the e-marketing firm currently boasts of North American customers numbering close to 32 million. The Groupon app has also seen app downloads totaling 157 million. 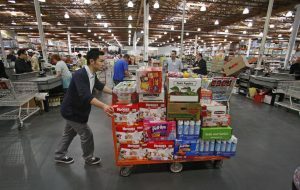 By the beginning of May Costco had amassed cardholders totaling close to 89 million. The most recent data from Sam’s Club however dates back to 2012 and membership then stood at 47 million. For the fiscal year that ended on January 31, Sam’s Club total revenues reached a figure of $57 billion against revenues of $486 billion for its parent company, Walmart. Currently the number of Sam’s Clubs in Puerto Rico and the United States is 659. In Costco’s financial report for its most recent fiscal year, revenues reached $119 billion. At the moment the number of warehouses that Costco has in Puerto Rico and the United States is 511.